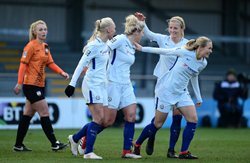 Chelsea Ladies are through to the fifth round of the Women's FA Cup after a 10-0 hammering of London Bees at the Hive on Sunday afternoon. Nigerian-born striker Eniola Aluko was not in Chelsea's starting line-up for this one. The damage had been done at the interval, as the Blues led 3-0 after scoring through Erin Cuthbert, Ji So-Yun and an own goal. Fran Kirby made it 4-0 after the restart, then grabbed her brace midway through the half, and additional tallies from Katie Chapman (2), Bright and Cuthbert completed the rout. Up next, Chelsea Ladies are guests to Birmingham City in the Women's Super League on Saturday, they will know their next opponents in the FA Cup when the draw takes place tomorrow morning. In another game today, Chelsea Development Squad thrashed London Bees 11-1 in the Development League Cup.